The Exustar SS503 MTB sandals has several straps that can be adjusted to get that perfect fit. Sporting a top guard, this adds protection during rides…best of all, these are SPD cleats compatible allowing you to ride even on rainy days! Overall, though I only had a couple of bike commutes with these sandals, I felt these are perfect for touring as you can wear them without socks (I didn’t feel skin irritation on my ankles or different parts of my feet as observed in other sandals). Also, these sandals may be ideal for those doing cycling/trekking trips as the cleats do not hamper your movement while walking (no metal scratching the ground sound as well!). and best of all, these save up on weight as you don’t need to bring slippers when on tour. A caveat though is that some users have suggested that you need to have the soles sewn in a shoe shop to prevent damage on the soles which may be caused by exposure to water during trips. I’ve followed this suggestion and hopefully, these will make the sandals more durable. I this entry, I describe in detail the gear used for my recent trip to Sagada. Dubbed as an apocalypse bike which is part of Surly’s touring line, the Surly troll boasts of a 4130 chromoly steel frame and fork making it a beefy, heavy steed. Though speed may not be its best features, it shines in terms of cargo hauling and comfort as the geometry prompts the rider to take an upright position while riding. Given its 26er geometry, the Troll performs well in climbs and descents as it is stable and handles with a relaxed feel (no constant twitching of the handlebar as you make steep climbs sapping your energy in maintaining balance while climbing). The beefy body of the frame helps dampen the harsh vibrations which may be annoying for riders especially with off road or unfine countours of pavement or occasional potholes. Since I packed heavily for the extended tour (as I always do), the Troll manages to carry my cargo without problems. While the frame provides the backbone of my bike, the SLX groupset provides a stable, maintenance free ride…considering that exposure to harsh elements, I didn’t experience problems in shifting or braking or breakdown with the small parts. As regards the wheelset, the Velocity Aeroheats are able to take a beating from the loads of the bike and the rider as well as the moderate, near harsh roads taken during the trip. No cracks were developed. Much like the previous long distance trips, the Hope Hubs worked satisfactorily-very minimal drag and is responsive to the ever changing pedaling effort done during the trip. The saddle has assured me of a comfortable ride throughout the tour and the cockpit gave me more comfort as the grips and butterfly trekking bar afforded me several hand positions minimizing the numbing of my hands or arms. Since the trip was harsh on tires due to broken glass, staple wires and other pieces of trash in the way, the Big Apples had excellent flat protection and the panaracer flataways held well . Upon inspection after the trip, several pieces of broken glass were found but did not penetrate the thick wall of rubber. The big apples were also helpful in cushioning the ride to add extra comfort in tackling the roads. As for performance the tires held well in different types of terrain-grip, responsiveness to steering and traction were satisfactory. In hauling my sleeping bag and other items for lodging, I used the terrapin drybag by Relevant Designs (https://www.revelatedesigns.com/index.cfm/store.catalog/seat-bags/TerrapinDrybag) and it too made my stuff wet free. The valve also assured that my stuff was airtight and free from moisture. The Lone Peak micro rack top bag (http://lonepeakpacks.com/shop/index.php/packs/rackpacks/st085.html) kept my tools and other small items intact-not waterproof though. The PacGear (https://www.facebook.com/PACgear/) half frame bag served me well in the journey…Though it wasn’t 100% waterproof as condensation occurred in the interior of the bag after several days of rain, putting stuff in zip lock bags prevented my gadgets and other items from getting wet. The zipper and stitching held through despite the load. No leg rub was experienced throughout the trip as well. The Conquer Scout feedbag (https://www.facebook.com/conquercustombags/?fref=ts) was used for my waterbottle and throughout the trip, it held well…other small items were stored and the straps didnt deteriorate throughout the trip. During the trip I also used the mount anywhere cage mounts (https://www.facebook.com/MountAnywhere/?fref=ts). Attaching them to my rack, my bottles didn’t fall off during the trip and were very much secure despite bumpy sections of the road. Since I have been doing multi day rides, I have avoided using jerseys as aside from being uncomfortable, they are difficult to dry out when washing. I have recently used the Lagalag trekking long sleeved shirts (https://www.facebook.com/lagalagstoremanila/?fref=ts) and the slits on the shirt have helped in the ventilation and are easy to dry out when washed. For protection from the cold, the Uniqlo heattech undershirts when sleeping or in cold weather at Mt. Polis. A much cheaper alternative and decent clothing to stay warm. Overall, I felt that the gear used in the trip was adequate for the extended tour. 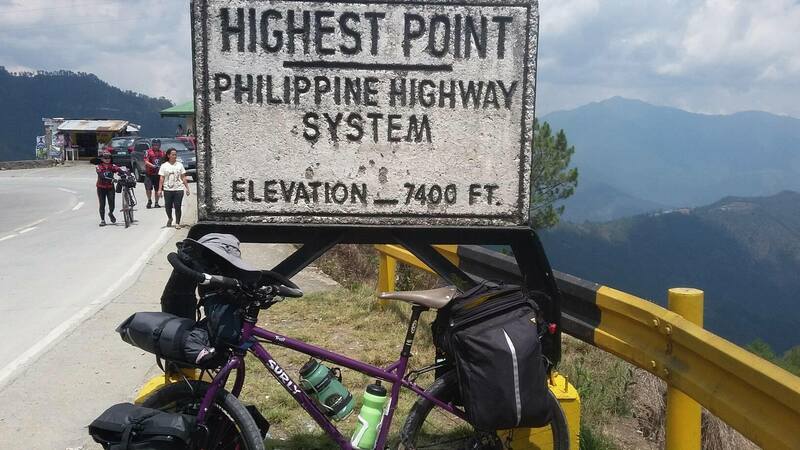 With the boom of bike touring in the Philippines, many makers of gear have emerged to respond to the growing needs of the local market. Earlier I have featured the bike bag makers in the Philippines (https://pedalpowerphilippines.com/2016/10/14/going-local-meet-your-bike-bag-makers/) and one of them is PACgear. The Cebu based company led by Hillboy Honoridez has sent me this wonderful half frame bag for testing. Also Myles Jamito of Mount Anywhere has come up with the solution to mount bottle cages on your fork. For this entry I test these two items and their potential for extended touring. Some limitations though, after a multiday tour last month, I have spent a several days riding short distances (about 30-50km) around the metro with varying road conditions (mostly asphalt but potholes are common) under heat and occasional rain. Ive tested the two items in three rides in the metro and therefore the insights I draw here may change after I do a multi-day tour again up north at the end of the month. PACgear reminds me of a company called Nashbar in the states, that provides different bags for the budget minded tourer. While low cost may be equated to unsatisfactory quality, this isn’t the case with PACgear. First, it is waterproof and after testing it under the rain and even hosing it for a couple of minutes, my gear remained dry. The zippers are topnotch and has good sealed seams assuring you that water is kept out. Second, the material used is similar to light rain jacket fabric-making it light and tear resistant. Examining the stitches, you’d get to see the keen attention given to the production of the bag. While the bag may lack padding (I believe this can be requested if you wish to have it done), my stuff remained stable (phones, a large powerbank, two small towels, plastic ziplock bags, wallet and even small chocolate bars for snacks) didn’t move while I was riding throughout. Third, the key to this product is customization. PACGear takes pride in assuring you that the bag that you get is fit for your bikespecs. While the straps are statitionary in the bag, it is open for slight adjustments making the whole bag secure. I didn’t experience slips nor leg rub while pedalling. Fourth, I like bright colors and while this color combination is the last on my list, I feel that with the variety of colors for the PACGear bags, this will help in making the riders visible but at the same time making your ride visually appealing. The key strength of PACGear is customization. I have had several conversations with Hillboy and he has been very receptive on what I wanted. In this case, I preferred something simple and easy to use and I got what I wanted. The Mount Anywhere bottle cage mounts (available here https://www.facebook.com/MountAnywhere/) is a very good solution to forks or frames lacking the necessary bottle cage mounts. In this case, since my Surly troll had too much of them, I decided to put them on my racks (hack-a-rack!) to see if they will hold. They are similar with Free Parable Design’s Gorilla clips (check it out https://www.facebook.com/theGreenBasikal/?fref=ts) which can be sourced in Singapore. The Mount Anywhere bottle cage is comprised of a hardplastic mount with several ziptie strips to secure the mount and cage. Upon installation, I had a bit of difficulty with the attachment as the adhesive may need your close attention to assure that the cage is secure. It took me about 20 minutes to attach my mounts and cages. Another issue I found is that some cages with thick attachment points may prove a bit difficult to install. To address this you may need longer screws. The good point however, is that Myles of Mount Anywhere can help you out on this if you encounter difficulty. In use, the mounts and cages remained intact, no shaking, bottles thrown out or annoying problems. Given that I rode in rough road in the metro, this seemed a very good alternative if your bike lacks bottle mounts. Also, the mounts are small enough to allow you to mount it in strategic positions in your bike. Ive mounted it at the rear and front rack giving ample space for me to pick it up while riding and putting it back securely without any interference on other parts of the bike while moving.